This advertising feature is brought to you by Johnniie Walker. Find out more. As the world's biggest Scotch brand, Johnnie Walker is served in the best restaurants and bars around the globe. And with roots firmly in Scotland, Johnnie Walker is proudly served in hundreds of outlets across Edinburgh and Glasgow's bustling food and drink scene. Many a bartenders' favourite, Johnnie Walker Black Label, is the perfect accompaniment to some of the amazing Scottish produce served in Edinburgh and Glasgow's restaurants. Treat yourself to one of Johnnie Walker's tantalising highball serves, the perfect start to an evening of good food with friends or family. An old favourite – Johnnie Walker Black Label with brown sugar, orange bitters and Angostura bitters, finished with some orange peel – the perfect after dinner to sip and relax. A fresh take on a classic whisky cocktail, this invigorating drink is a combination of Johnnie Walker and ginger ale, with a wedge of freshly squeezed orange bringing a sweetness to the spicy ginger notes. 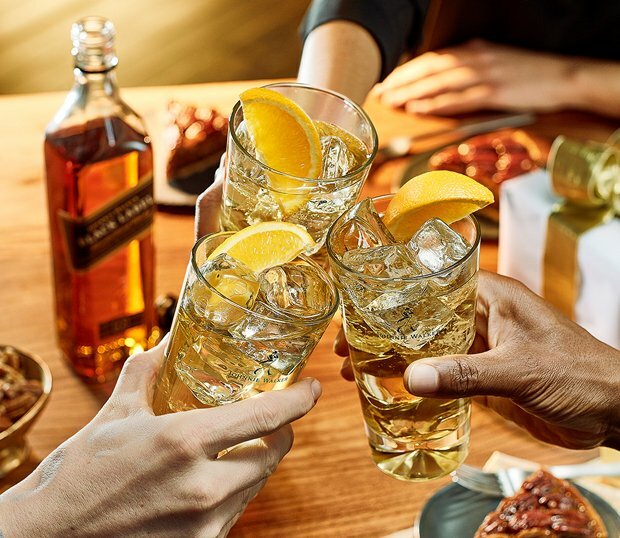 Ideal for the whisky novice, a Johnnie and Ginger highball enhances the unmistakable taste rather than masks it and Johnnie Walker Black Label's signature smokiness delivers a rich, complex flavour – ideal for pre-dinner drinks. Perfect for a relaxed evening, a Johnnie Walker and soda is smoky and full of flavour. A favourite among Johnnie Walker lovers, this time-honoured cocktail doesn't compromise any of the unique flavour profiles present in all Johnnie Walker blends. The smooth, smoky flavour of Johnnie Walker Black Label makes it the perfect Scotch to try with different mixers in a highball serve. From a refreshing ginger ale to a sweet orange juice or even a smooth coconut water - the options are endless. Whatever suits your palette, why not treat yourself next time you are enjoying a meal out. Visit johnniewalker.com for more tasty serve suggestions.